This is my Sincerely Jane at the end of November. 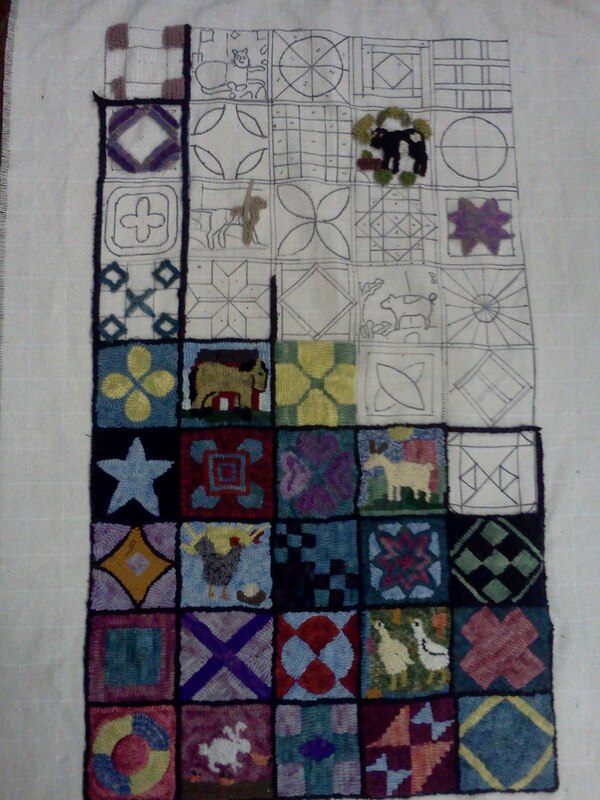 If I count the partially done blocks at the top of the rug, I'm halfway finished. I'm expecting a slow weekend at the store, so I should be able to get several blocks done. 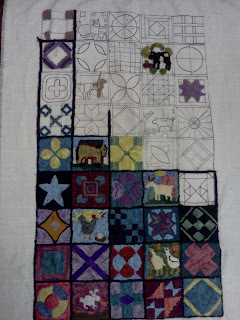 I'm finding this challenge is a lot more challenging than I expected - each block has to be individually color planned and then coordianted with all of the blocks around it - it's just like hooking a brand new rug for each block. The only blocks that aren't hard to do are the animal blocks - my favorites. The next animal I'm going to do is the dog - I'm going to reverse hook the tan I started with and hook the dog with a black and white tweed, in honor of Blue. I'm anxious to get this rug finished, or at least close to finished, so I can start the Frost Lion pattern. I love it!!! great job. can't wait to see the finished rug. Phyllis, it is looking mighty pretty. It really does give us a sense of accomplishment when we can finish a square ~ and because of its size it goes rather quickly. I was lucky enough to see this in person & the colors are so vibrant! even though it's a traditional pattern there is something modern about it. I love it, Phyllis!